This post will cover my Spring Equinox / Ostara altar for 2017, complete with a full description, photos and a correspondence image. 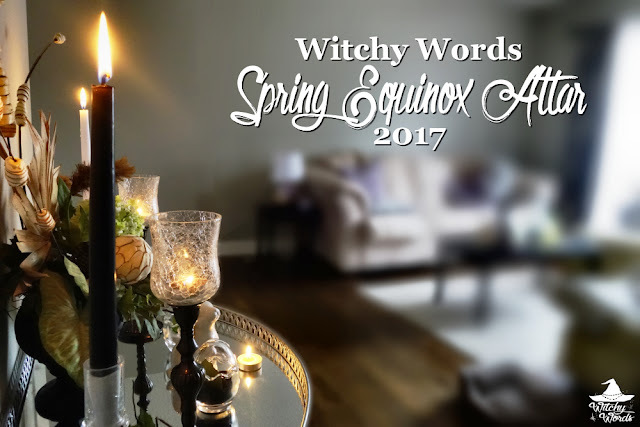 A 24 hour span where day and night are equal in length, the spring equinox is a sabbat of growth, prosperity and new beginnings. While fertility is often associated with Ostara, it need not be fertility of the body; instead it could represent the fertility of the land or the development of a new career which may generate prosperity in our pockets. From here, each day after this holiday grows longer, warmer and more fruitful. Spring is the time to sew your seeds, be it actual plants or the beginnings of a new venture in your life. For this altar, I balanced the dark with the light by placing black candles on the west-most side and white candles on the east-most. This symmetry represents equal night and day, as represented by the equinox. For the taper candle holders, I added the opposite color of sand to hold them in place: For the black taper candle, there's white sand and for the white, there is black. This represents the little spark of light in the darkness and the shadows in the light. Oftentimes, witches and pagans will warn against using candles that are white dipped in the appropriate color. In this case, I preferred it. As we move forward from this holiday, the days will get longer. Therefore, it makes sense that the light appears within the darkness in this taper candle. A note that I purchased all four candle holders at the local thrift store for about $8. Altars don't have to be expensive to look good! In the center of the altar is a faux plant, two egg-shaped glass offering bowls, a white rabbit and a green candle. Much symbolism will be derived from this, so let's tackle this one at a time. The faux plant and center-most tealight are green. Green represents prosperity and abundance as the world awakens from its slumber under the cold, hardened earth. It is in between the dawn and the dusk that we find this growth the most, thus why they sit in the center of the altar. Each egg-shaped offering container is lined with sand: Black sand for night and white sand for day. In the black sand offering bowl, which is to the west of the rabbit, I've placed bay leaves, star anise and amethyst. Bay leaves have narcotic qualities and correspond with oracle and protection. Star anise is known to guide dreams and aid in clairvoyance. Amethyst is a stone that calls for spirituality and healing. All of these create an offering for psychic dreams and spirituality that is often associated with the night. 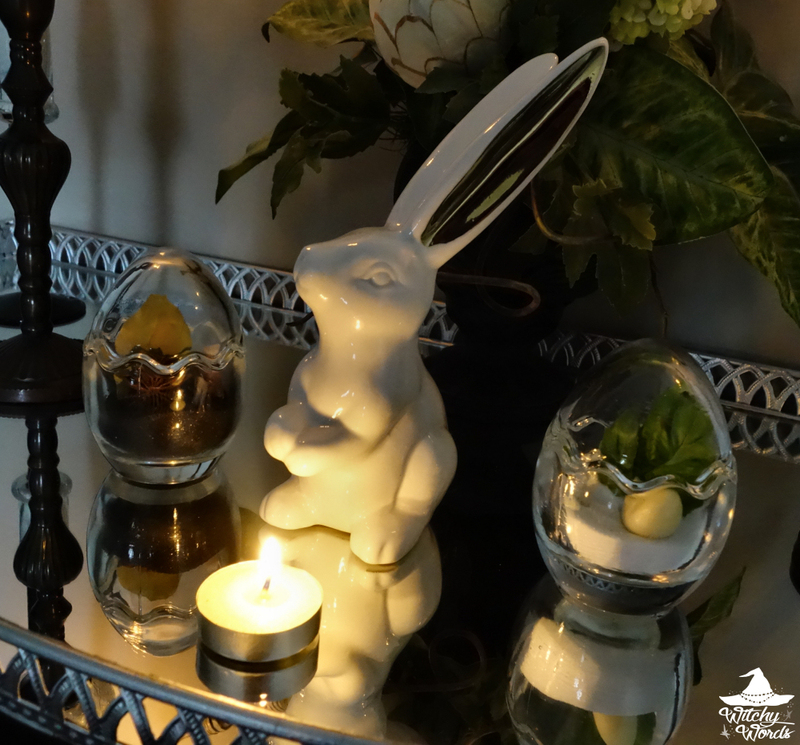 The white sand offering bowl to the east of the rabbit contains basil, garlic and crystal quartz. Basil is great for happiness, money and prosperity. Garlic is handy for protection. Finally crystal quartz is good for healing and protection, and it amplifies the qualities of what's around it. Together, this container creates an offering to the day for physical world needs like both physical and mental health, career and stability. 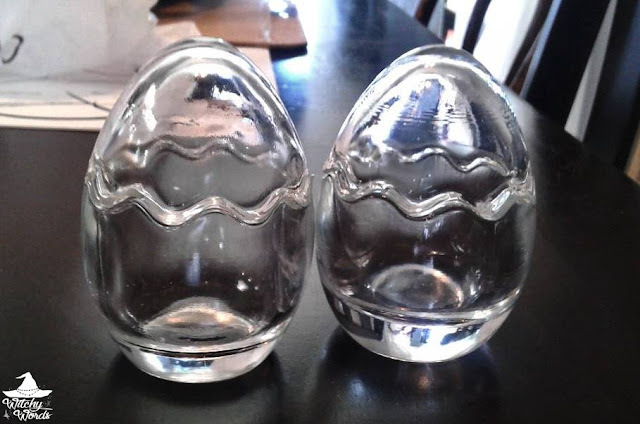 A note that these clear glass egg-shaped offering containers were repurposed from colored glass egg candles. Popping them in the freezer made the wax fall right out. 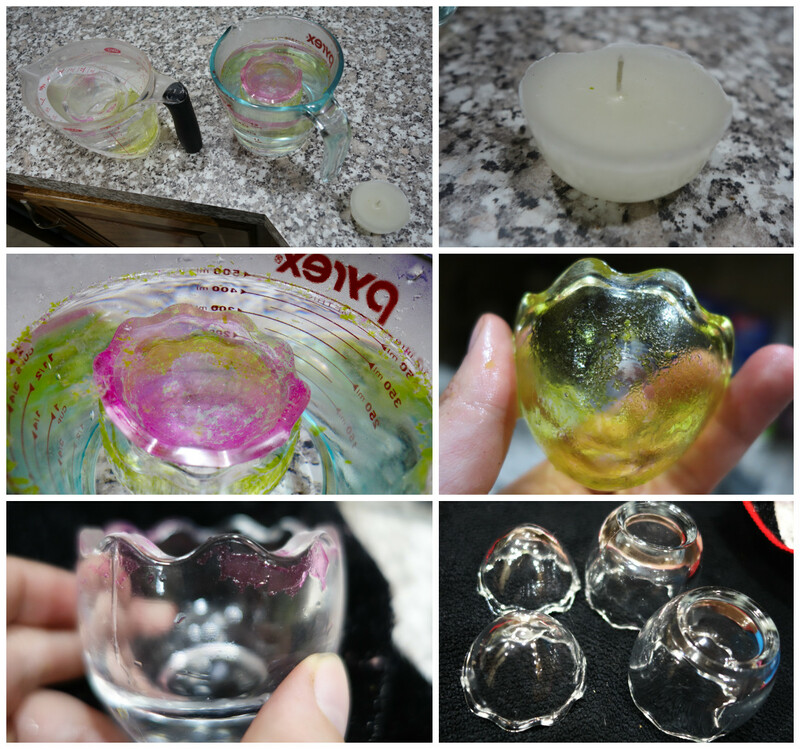 I then submerged them in hot water and dish soap until the translucent paint was peeling and flaking off. Using a scouring pad, I scrubbed them clean. I believe I purchased these a couple years ago for a dollar total but had to store them away for a while once I didn't have an altar. Once again, thrift stores to the rescue! 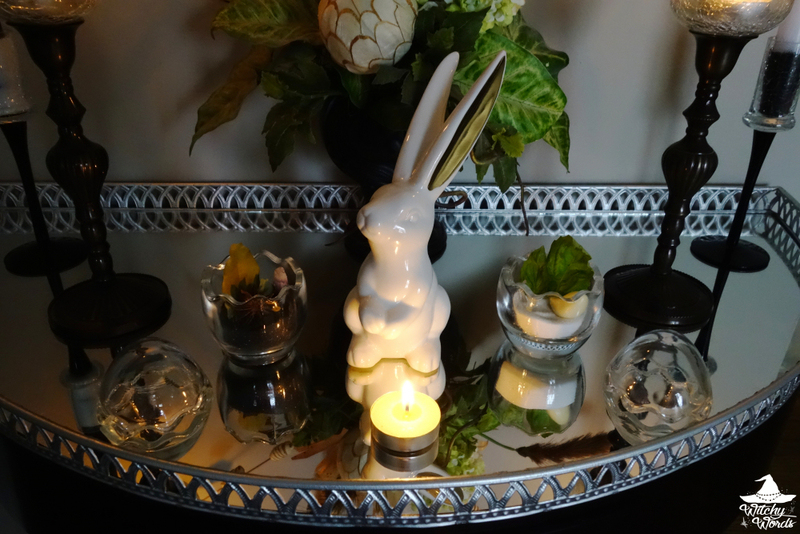 Finally, at the very center of the altar sits a white rabbit. This rabbit is upright and alert, not scared or reserved. It faces the darkness with absolutely no fear while its golden ear reflects the light of the golden sun from the east. This rabbit is representative of the self as we move forward into the lighter part of the year! 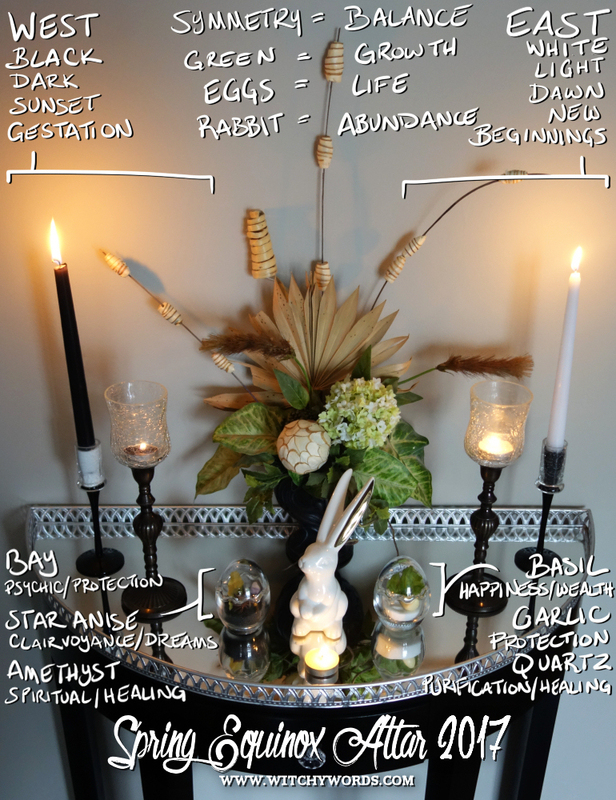 With that, I will leave you with a visual correspondence chart of this altar. Enjoy! To see my 2015 Spring Equinox / Ostara altar, click here! Did you get your rabbit at Target?! It wasn't Hobby Lobby, was it? I cannot remember where I saw these rabbits, but I remember I almost bought the same one and decided to purchase a solid gold one instead. It wasn't - I avoid Hobby Lobby at all costs for various reasons. We have Michael's here, which is our "big box" craft store that I prefer. I was wondering where you got the glass eggs? Hi Anon! I'm surprised I didn't mention it in the article. I actually just got them from a local thrift store.